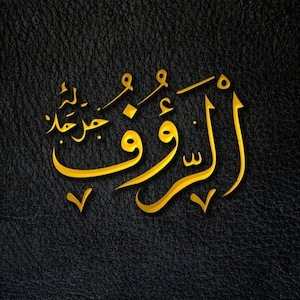 Ra’uf is a more intensified form of mercy. Ra’uf is one who is so merciful, that his mercy extends before the calamity hits, and involves him taking care of you and warning you so that a calamity does not hit. Sheikh Ratib an-Nabulsi gives an example of a father who is protective of his children, and especially during the winter when he dresses them in warm clothes so that they do not suffer from the cold. That is ra’fa. Whereas a father whose heart aches because his child has become sick, and does everything to get the medicine to ease his child’s pain, is merciful—raheem. Imam Al-Qushayri states that ra’fa is the highest form of mercy, where God protects His servants by warning them of the deeds the necessitate punishment.